If I remember correctly, Angel's Drive-in was on the corner of Admiral and Memorial, where the McDonald's is now. I have a vague recollection that they had air conditioning ducts you could stick in your car window during the summer months. Dad would take us there for dinner then out to the airport to watch the planes come in. Seems like that was a popular pastime on weekend nights back in the 50s. The parking area out at the south end of the runway was always full. 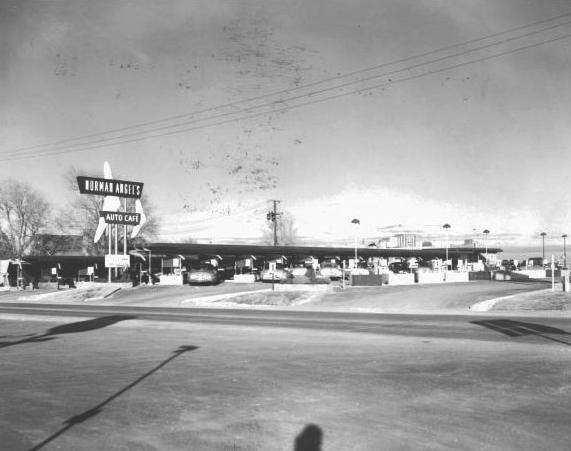 Norman Angel's Drive-in was indeed on the northeast corner of Admiral and Memorial. I believe it was frequented more by adults, but have very fond memories of eating there a few times with my family in the early sixties. I also seem to remember someone being struck and killed by lightning in the parking lot there...I was about 5 at the time. I do remember it being a treat to eat there and I, too, believe they had vents or tubes that would blow cold air into your car during the summertime. Big Ed's burgers lasted more than a year at Admiral & Memorial and Ed himself was there on some occasions working the "griddle." The place turned into Donnie's Old Fashion Hamburgers (7842 E Admiral Pl., apparently gone as of 4/18/2007...webmaster), and still does a decent job of "Old Fashioned Hamburgers" and fresh cut fries. Now what intrigues me is the owner is the son of the owner of Norman Angel's, the drive-in that was where the McDonald's is now on the northeast corner of Admiral & Memorial. I remember it being a cool hangout in the 50s! Tulsa briefly had a Big Ed's in the strip center on the southwest corner of Admiral and Memorial in the mid-1980s. It got a little publicity when it first opened for its huge burgers, but apparently didn't last long. I ate there a couple of times (ate only their smaller burgers), but the burgers didn't seem to be as good as the FreddieBurger in Bixby, which was my favorite at the time. There were several Big Eds in the Tulsa area, specifically I remember one at 41st & Garnett which became Bogey's, it is still there, and operating as Bogey's. The other I remember was in BA at 81st & 145th in the shopping center on the NE corner. It too became a Bogey's and eventually went out of business. Big Ed's was at both locations for several years. I wasn't a "Brooksider" growing up, but I am aware of the good times that could be had at drive-ins! Many a guy has asked for Mom & Dad's car, to go get a burger, and check for babes. Usually it was the poor car hop who was visually molested, stiffed of tip, and had to smell Mommy's car that had its choke pulled to make a "rumpety-rump" sound like a hotrod might. Yep, nothing like going to Norman Angel's and watching DC-3's take off and land as you looked for cool cars and girls. The owner was on the lookout for troublemakers whose worst crimes were usually "spinning in the gravel" making clouds of dust for the patrons. I only heard of that! Not!